[SHIFT-IT Coach] Do You Consider Yourself a Cultural Creative? Welcome to your September SHIFT-IT e-Zine. Feature Article: Do You Consider Yourself a Cultural Creative? Well, right now, while you read this, I’m doing something I’ve wanted to do for over 20 years! This Friday and Saturday I’m hosting my own corporate strategic planning/visioning retreat. Twenty years ago I dreamed of having my own company – something that would be aligned with my personal interests and values. Something that would be a solution and positive force in the world, in my own unique way. I went on to study organizational development in grad school in the mid-90s. Then onto a career as a graphic recorder and facilitator --- helping organizations clarify their visions and plans and shift their cultures. Now, finally, I have begun to build my own real business (instead of a just solo facilitation and coaching practice). It’s still small (me and three part-time team members) … but I’m determined to walk my talk as CEO and apply the practices that I know make organizations healthy and happy. We’re starting our company retreat with some personality work to understand our natural preferences and ways of working. Then moving onto doing environmental scan work on SHIFT-IT Coach’s business environment. Then into visioning and developing a detailed two-year operations plan. I can hardly wait to get this all mapped out! 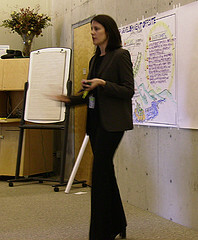 Plus I’m bringing in my local mentee, Lisa Arora, to be our graphic facilitator. Now I can finally sit back and have someone else draw my thinking out of me – what a luxury! As for an article this issue … I just finished writing an article for inclusion in an upcoming Association of Web Entrepreneurs book (I’m one of their contributing experts). We were asked to write on a Future Trend of our industry. Since I’m in the ‘self actualization’ industry, I opted to write on the acceleration of the ‘Cultural Creative’ market. Chances are, if you are reading my e-zine, you are a Cultural Creative too. This article is written from an internet marketing lens (as that is what AWE is all about), so a bit more business oriented than what I usually write about. 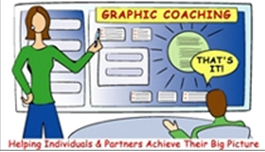 It’ll give you a glimpse of what has gone on behind the scenes of SHIFT-IT Coach, Inc.
Fall & Early New Year: Private Graphic-Skills Training: There are just two blocks left in my fall calendar for you to schedule a one-to-one training with me to be privately mentored in graphic recording and graphic facilitation skills. Due to interest and demand I have decided to extend this option into the New Year. You’ll want to book your dates now (up to 6 months in advance... easy pay-ment plans available). My current ra-tes are extremely reasonable, but please consider yourself notified that they will be increasing significantly in January. Please contact [email protected] to schedule an exploratory interview. Click here for More Info. 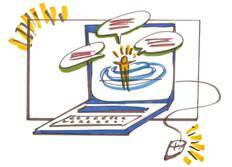 In Your Words: Have news and testimonials to share about the results of your SHIFT-IT experience? Just send us a brief blurb with your photo to share your news with the SHIFT-IT community. ARTICLE: DO YOU CONSIDER YOURSELF A CULTURAL CREATIVE? Social demographers and researchers have been tracking the emergence of a new category of people in the last 50 years. Known by several labels (‘cultural creatives’ ‘integrals’ and ‘greens‘) this group of 50 million (25% of the adult population in North America and an additional 80-90 million estimated in Europe) is unique for their shared interests in ecology/global awareness, social justice, self-actualization, spirituality and self-expression. If you aren’t personally one of these people, then chances are they surround you or they are entering your periphery in growing numbers. Sociologist Dr. Paul Ray and co-author Sherry Ruth Anderson (Cultural Creatives: How 50 Million People Are Changing the World) have been tracking this group for the last 15 years and believe it is still in a phase of accelerated growth. That a deep shift in culture is occurring as an immense group of people change their minds and unite around a broad set of values. Today’s dominant culture (coined ‘Moderns’) that primarily prizes money, materialism and status, is in decline, and Cultural Creatives are on the upswing. However, very interestingly, this shift from a modern mindset to a culturally creative one can take individuals at least a decade to personally navigate and to bring their lives in alignment with their beliefs and values. So, take note — many, many people are still progressing through this state of transition and will continue to for years to come. New Videos Up on YouTube! Come Join Me in Mexico!